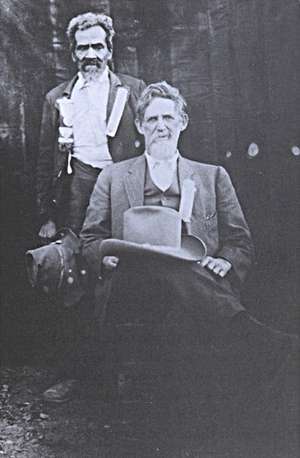 David Lafayette Holcomb (seated) and Jim Woods are shown in a 1900 photo the year before Holcomb founded the town of Holcomb, Mississippi. They both appear to be wearing medals or badges from some event. The two men came to Mississippi from Texas together as young men after the Civil War and were closely associated all their lives. Their friendship may hold clues to early photos of the town that show Main Street's diversity.